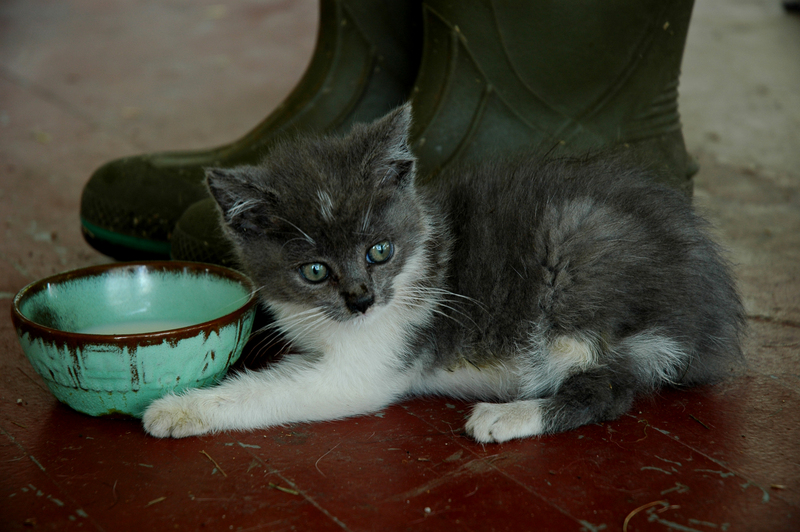 Well your kitty survived the night and here he/she is with a wet little nose and a bowl of milk and honey. Still limping and slow but at least it has given up on that piteous crying. And yes – ( thank you for all your heart-wrenching messages ..) she is kind of cute I guess. Today I have to drive up to the airport (about two hours) to pick up The Matriarch, my mother in law, great friend and chief taster. But before I go I wanted to show you what I picked this morning. Very very early this morning because it is terribly hot today already. But that is Ok as I am going to spend most of today driving The Matriarchs’ refrigerator on wheels with the air conditioning ON, up to Chicago and then back again. Anyway so I pulled up these beetroot. I Love beetroot. Here they calls them Beets. I am growing a fair few because this year I want to put some in jars and store them. I will quickly tell you my favorite way to prepare beetroot as a side dish. The tang of the beets and sweetness of the balsamic are just great. If you are drinking a corona and have a lime on the counter just a tiny squeeze of lime at the end is lovely too. Wash Beets, trim leaves off, leaving about an inch of stalk on. Boil until soft but not too soft. Cool. Slice about 1/4 inch thick. Heat a cast iron pan then melt a good tablespoon of butter, throw in a few dill seeds and grind in some pepper and a pinch of sea salt, toss for a few seconds. 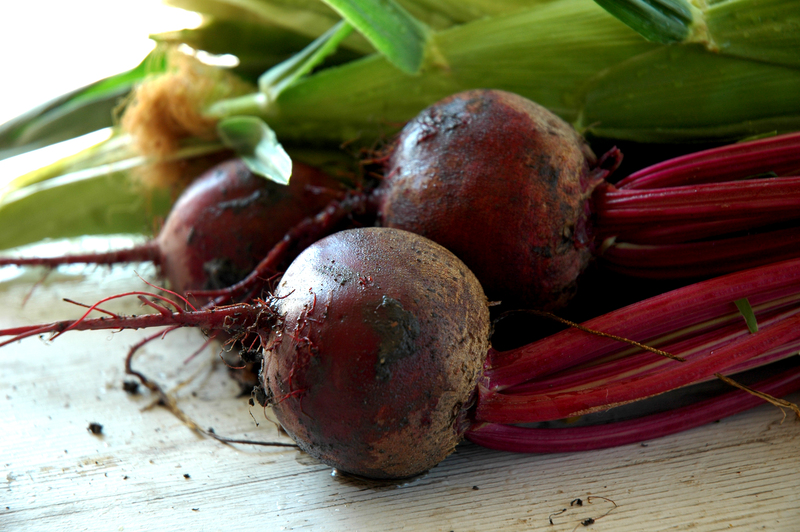 Add your sliced beetroot and cook through quickly turning until they are sizzling in the hot butter. Barely cover in balsamic vinegar, turn the heat down and cook gently until the balsamic is a heavy sheen on the beets. It will evaporate quite quickly so pay attention. No wandering outside to sit on the swing chair with that Corona until you are done! Remove from heat, cool and serve at room temperature topped with chopped fresh dill. DIVINE. My beets are in the pot and when I get back from the airport I will go to the second stage. You will also see that behind the Beets is a pile of Sweetcorn. (yes sweetcorn season is here and it will be a short one because of this massive heat.) Sweetcorn pleases everyone. Our John cooks it on the grill. Gently peel the green husks back, do not rip off, extract all the sticky silks, re-wrap in its green, soak for a while in cold water, (now you can sit in the swing chair) then onto the grill for however long it takes depending on the heat of your fire, we do this every night while there is corn. But wait there is more to the corn story. After I have finished picking enough for us for a meal, I haul the entire corn-stalk out of the ground and throw it over the fence to the cows and sheep. They love sweetcorn stalks. Especially now that the grass is turning to upright hay in the fields. I used to chop the stalks up for the young ones but then I got lazy one day and just yanked them out hurled them over the fence and to my delight the animals just gnawed away for hours eventually consuming everything. So there you are laziness has its own reward! Of course when the chickens get in on the act, it is quite the free for all. 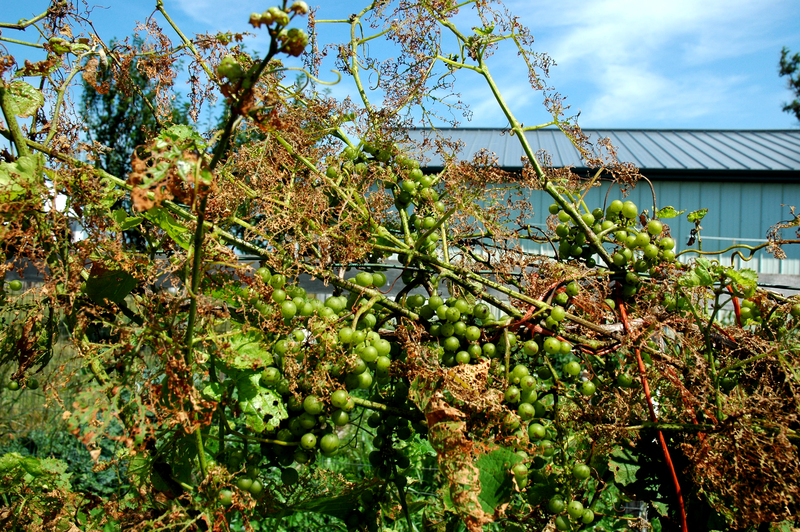 Just now I took the camera out to grab a few shots for you and look at this sad shot of my grapevines. All the upper third of the vines look like this. The Aftermath of the Beetle. However as I said before we will not have to summer prune that much this year. And with it being so hot and dry. Well, Maybe we will get some grapes. And then a few bottles of wine. Maybe? Poor poor vine. And here are a couple of the bee hives. 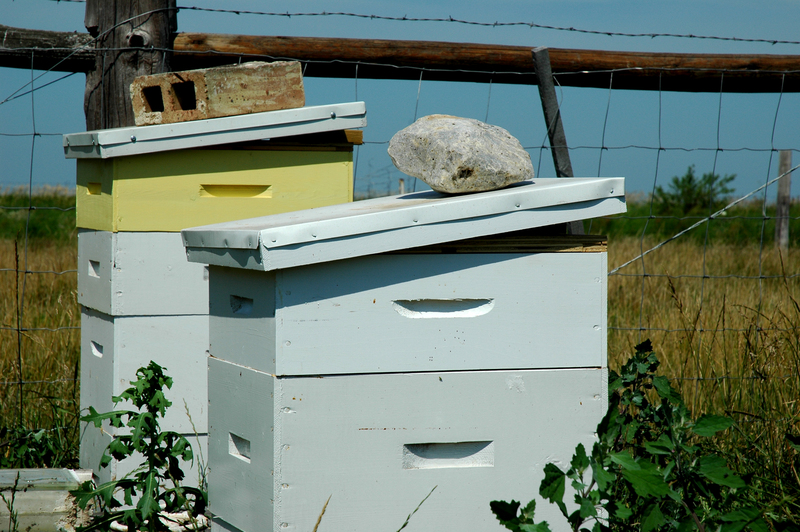 With their lids propped open to help the bees cool inside their hives a little. It must be SO hot in there. It is over 100 degrees out there now. 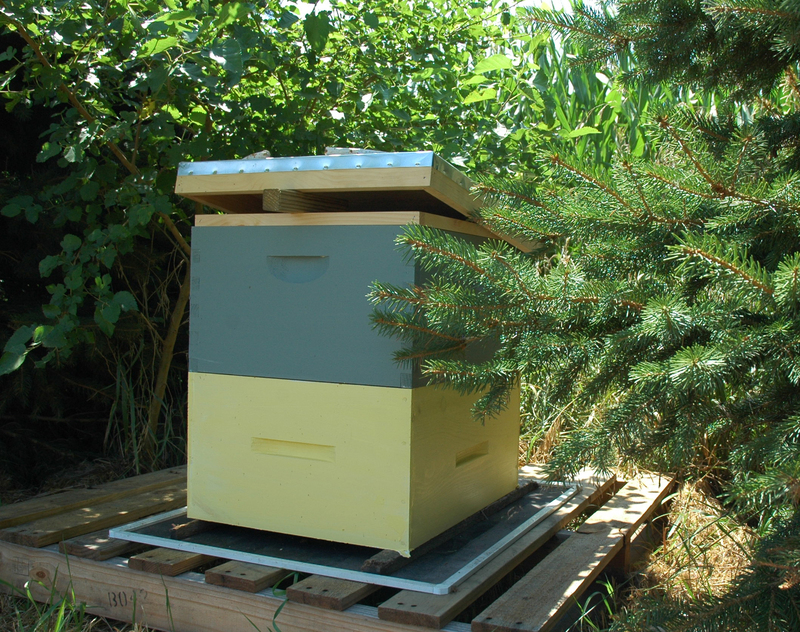 The topmost supers on these hives are smaller because they are for gathering honey. We have high hopes for these little boxes. I will take you out in a few weeks and we will see how they are doing! You will remember that both these hives lost a swarm (about half their bees ran off!). I did capture these swarms and they were returned to new hives, one of which is your Blog hive. But with the loss of so many bees it will be interesting to see what honey production we do get. Here is your Blog hive. Living the best bee life as it is still under a tree! Note that it now has it’s second story. They seem happy and are very busy. I am off onto the Highways. It’s so amazing all the things you do. I really admire how together you are. Really great blog!